Bank Nifty declined by more than 4000 points within last 2 months (From 29-Jan-2018 to till date) and decline is sharp and impulsive which started from high 27652 and registered low 23605 till now. And it has been 2 months before I had prepared my last analysis report on all time frames. So, this weakened I again decided to look at all time frames to conclude future possibilities. This is Monthly time bar chart of Bank Nifty covering life time move from low 3314. It seems wave (1) may be completed at 13303, wave (2) may be completed at 7766 as Simple Zigzag and wave (3) may be in progress from 7766 on largest time frame chart. Within wave (3), it seems inner waves (i), (ii), (iii), (iv) are completed and wave (v) may be progress from 13407. Again within wave (v) of (3), it seems wave  may be completed at 20575, wave  may be completed at 17606 and wave  may be in progress from 17606. Other Possibility: Or maybe it is just inner wave (i) of bigger wave (3) completed at 20907, (ii) completed at 13407 and (iii) in progress. 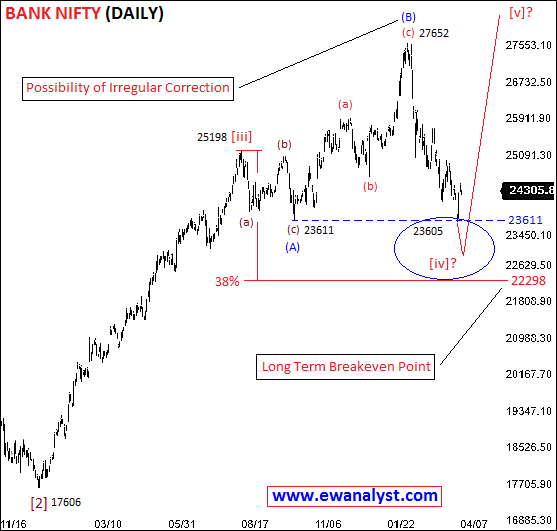 Overall in all the cases, Bank Nifty is still within wave (3) on larger time frame which indicates that Bank Nifty still has long way to go on larger time frame, although small corrections are expected in between. This monthly chart can help in suggesting trend for larger time frames but is not going to help in calculating any confident upside levels for short/medium term trade. So, we need to analyze the progress of very last upside wave  of (v) of (3) started from 13407 separately on lowest possible time frame to calculate further levels. This is Daily time bar chart of Bank Nifty which I am expecting as start of wave  on the previous chart. It seems wave [i], [ii], [iii], may be completed till 25198 and wave [iv] may still be in progress as Irregular Correction with inner wave (A) at 23611, Irregular (B) completed at 27652 and (C) may be in progress from 27652. Minimum 61% projection for wave (C) is already achieved and normally wave (C) of Irregular Correction completes near the end of wave (A). End of wave (A) is 23611 and 38% retracement of wave [iii] is 22298. So, 23611-22298 is the expected range where wave (C) can complete followed by sharp bounce for new high. Wave (C) already entered in 23611-22298 range. Now, we need to analyze the progress of wave (C) started from 27652 to calculated its end which will be the bottom of this downtrend. Wave (C) must complete as Impulse. This is 5 Hourly time bar chart of Bank Nifty covering decline from 27652 which I had marked as start of inner wave (C) of Irregular Correction. Wave 5 achieved its minimum 38%-61% projection placed at 24718-24098 whereas 100% placed at 23094 which may or may not be achieved. 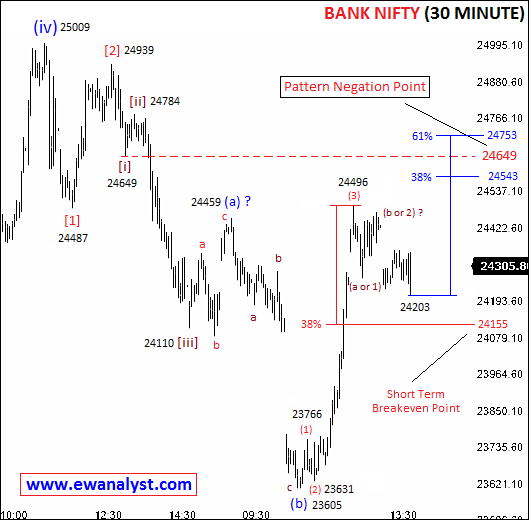 Bank Nifty achieved 23605 till now. 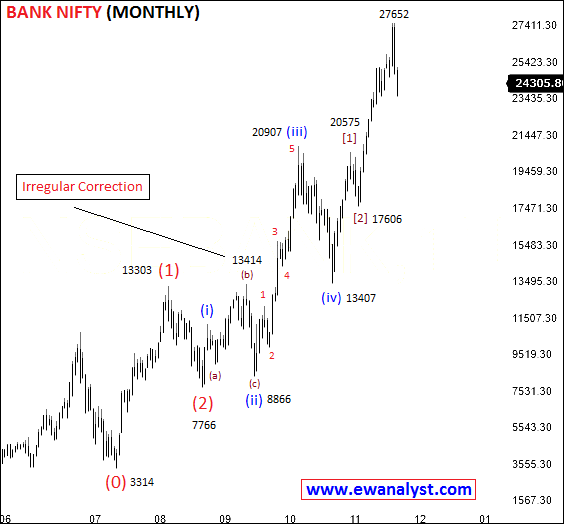 Within wave 5, it seems wave (i),(ii),(iii), (iv) may be completed till 25009 and wave (v) may be in progress. Wave (v) achieved its minimum 38%-61% projection at 23973 whereas 100% projection placed at 23334 which may or may not be achieved. 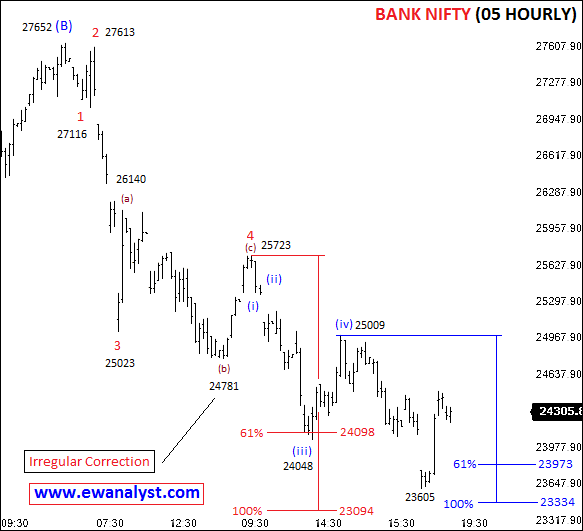 Bank Nifty achieved 23605 till now. Now, we need to analyze the progress of (v) started from 25009 on separate chart to check its position. This is 30 Minute time bar chart of Bank Nifty covering move from 25009 which I am expecting inner wave (v) of 5 on the previous chart. It seems wave completed from 25009-24487 may be wave , wave completed from 24487-24939 may be wave  and wave  may be in progress from 24939. Within wave , it seems ‘i’ may be completed at 24649, wave ‘ii’ may be completed at 24784, wave ‘iii’ may be completed at 24110 and wave ‘iv’ may be in progress as big irregular correction. If wave ‘iv’ is still in progress as Irregular Correction then wave (a) of ‘iv’ may be completed at 24459, (b) may be completed at 23605 and wave (c) may be in progress. Wave (c) of Irregular correction can complete near end of wave (a) which is at 24459 and maximum limit for wave ‘iv’ is end of wave ‘i’ which is at 24649. So, 24459-24649 is the range from where Bank Nifty can decline again. Within wave (c), it seems wave (1) may be completed at 23766, wave (2) may be completed at 23631, wave (3) may be completed at 24496 and wave (4) may be completed at 24205 or still in progress. Minimum 38% projection for wave (5) is placed at 24543, and end of ‘i’ is at 24649. So, 24543-24649 is the expected target range for completion of wave (c) of wave ‘iv’ with 24649 as pattern negation. 38% retracement of last bounce started [23605-24496] is placed at 24155 which is the immediate breakeven point on downside below which further decline towards 23605 is possible in coming days. Otherwise Bank Nifty if break above Pattern Negation point 24649 then further bounce towards 24753-25009 is possible. For Medium/Long term, there is possibility of big Irregular Correction at top, so Bank Nifty is still in medium/long term positive zone and 23611-22298 is the range from where Bank Nifty can start new rally for new high. This upside rally can be sharp because of Irregular Correction. But 23611-22298 range is big and we don’t have exact bottom, so we need to concentrate on decline from 27652 for time being. For short term, Bank Nifty is still in negative zone as long as trading below Pattern negation point 24649 and 24543-24649 is resistance range on upside from where a small or big decline can be expected but there is possibility of bounce towards 24543-24649 before the decline. 24155 is the breakeven point on downside below which further decline towards 23605 can be expected and same can be used as stoploss for any long. And if Bank Nifty broke above Pattern Negation Point 24649 then further bounce towards 24753-25009 is possible. We need to keep all these conditions in mind while planning next trade. Bank Nifty if get in 24205-24155 range, then buy Bank Nifty 24100 Call of 06 April expiry with exact stoploss of 24099 (some points below 24155) expecting target 24543-24649. Initiate trade only if get Bank Nifty in entry range without hitting 24496. Or Bank Nifty if get in range 24600-24649, then buy Bank Nifty 24200 Put of 06 April expiry with exact stoploss 24769 expecting target 24205 and below in coming days.